Above: The Mississippi River meanders over walls and ceilings in the sequined artistry of “River,” at the Des Moines Art Center. An example of the workmanship is detailed below. How have you spent the past 12 years? What has happened in your life since 2006? 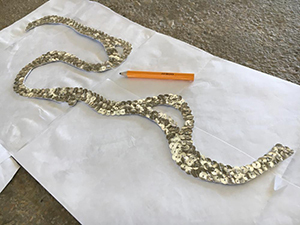 That’s the year the artist Jen Bervin started hand-stitching silver sequins onto irregular strips of paper. And now, a dozen years later, those shiny strips curve along the ceiling and walls at the Des Moines Art Center, combining to form a shimmering map of the Mississippi River. If you could stretch out the whole thing, “River” would measure 230 feet, or about one inch for every mile of the real thing. The artist, who grew up in Dubuque and now lives in Connecticut, estimates that it took her as long to sew each section of her handmade river as it would to walk the real one, from its Minnesota headwaters to its Louisiana delta. The artwork is as beautiful as it is hard to photograph. It snakes across the Pei wing’s rough concrete walls and catches light from the big windows. One section seems to float on wires between the rafters. When I pulled out my phone to snap a shot or two, with mixed results, I called up Google Maps to see if I could identify certain sections of river. I spotted the swells of Lake Itasca and Lake Bemidji at one end and Lake Pontchartrain at the other but couldn’t pinpoint the Iowa section that forms what I’ve always thought of as the state’s eastern snout. A docent told me the map is actually geocentric, as if the viewer is looking at the earth’s surface from the inside out. But most maps are top-down, as if we’re gazing at the world from an airplane. The artist has a knack for shifting perspectives like that. In a project last year, called “Silk Poems,” she wrote a poem from the perspective of a silkworm, nano-printing the critter’s DNA code in gold onto a piece of silk fabric. Bervin “finds impossibly poetic ways to imagine the unimaginable,” University of Illinois scholar Kendra Paitz writes in an eloquent pamphlet that accompanies the installation and opens up questions of history, culture and ecology. She cites an essay by Toni Morrison called “The Site of Memory,” which suggests that the Mississippi doesn’t “flood” so much as “remember” where it used to flow, before it was straightened here and there to make room for human development.